When one thinks of weapons of mass destruction, such as incendiary weapons that can raze towns to the ground, or bombs that can level cities with their power, the immediate association is one with the wars and weaponry of the twentieth century – certainly not the sixteenth century. While most amateur historians are aware of the fact that cannons were in regular use by the late medieval period, and that primitive grenades became relatively widespread in warfare a century or two after this, few know that in the sixteenth century an Italian engineer developed the most powerful bombs Europe – and likely the entire world – had ever seen: entire ships packed with gunpowder, which decimated enemy fleets. Hellburners at Antwerp by Famiani Strada. The concept of using an entire ship as a weapon – an incendiary weapon in particular – is not a new concept. In fact, it is quite an ancient one. The first “fireships,” as they were called, were used in the Peloponnesian War between Sparta and Athens from 431-404 BC. The Spartans attacked the Athenian fleet with an old merchant ship filled with tinder and wood, which they set alight on a particularly windy day and sent off in the direction of the Athenian ships. Later, during Alexander the Great’s siege of Tyre, an island city, the Tyrians constructed a wooden causeway between their city and the mainland. Alexander’s Macedonian forces attacked this with a similar fireship and destroyed it. Fireships of this type were also used both by and against the Roman Empire. Hellburners, which were used in the 16th century, were similar in conceptual terms to the fireships of the ancient world. Thanks to gunpowder and advances in ship-building after the late medieval period, which meant that ships of greater size could be constructed, the destructive potential of these weapons increased exponentially. No longer was their aim merely to set fire to an enemy fleet or dock, an effectively destructive act in itself – no, the explicit aim of a hellburner ship was to utterly obliterate as many ships as possible with an explosion of monstrous proportions. The concept of the hellburner was developed by an Italian military engineer named Federigo Giambelli. 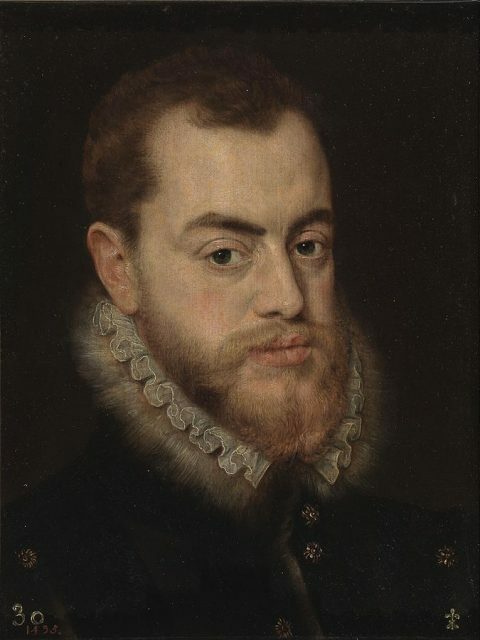 He first approached the Spanish King Phillip II and offered him his services, but after his offer was rejected he set his sights on the Dutch court instead. At Antwerp he was welcomed with open arms, and, as the Dutch had just begun what was to be the Eighty Years’ War against Spain, Giambelli was able to put his talents to use right away. He had vowed to take vengeance against the Spanish, who had spurned his offer of service, and what better way to get revenge than by destroying their ships? Giambelli first outlined his design for a hellburner ship in 1585. At this time the Spanish had used their ships to create a blockade across the River Scheldt, which connected Antwerp to the ocean. Unless the blockade was broken, the city would be starved into submission. Giambelli, it turned out, had a perfect idea for how to smash through the blockade. Painting of a Dutch fireship attack on the English flagship Royal James. His plan was simple, yet it would turn out to be brutally effective. He asked the Dutch for three ships to turn into weapons – weapons of mass destruction. Unsure of how feasible his somewhat outlandish plan was, they gave him only two ships which were smaller than he had hoped for: a pair of old merchant ships called Fortune and Hope. 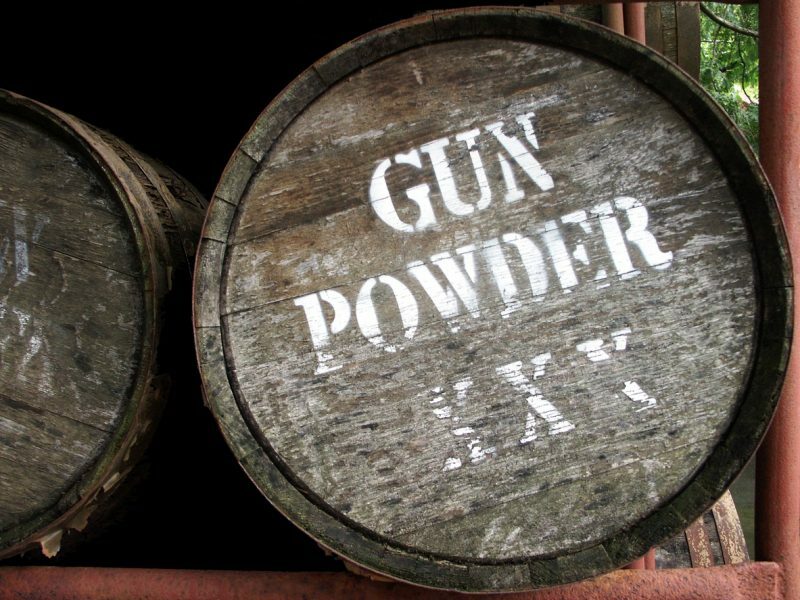 Inside each ship he constructed fire chambers, into which around 7,000 pounds of gunpowder per ship were tightly packed. The fire chambers were surrounded with material that would prove to be immensely destructive when sprayed out as shrapnel in the blasts: old tombstones, rocks, iron hooks, scrap metal, and other such objects. What was especially innovative about the hellburners was the methods of detonation employed. On Fortune, the explosion would be set off by means of a slow-burning fuse. On Hope, there would be a revolutionary timer mechanism, specially designed by a master clockmaker, connected to a flintlock that would detonate the explosion. 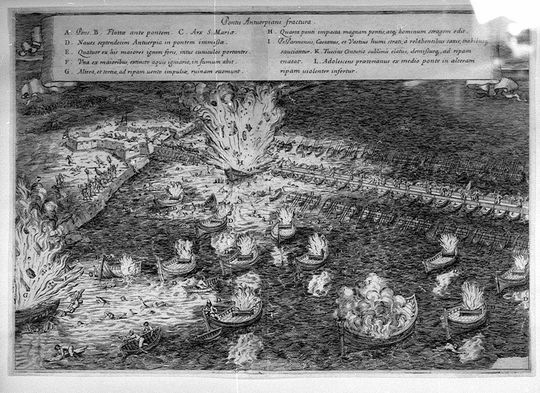 Engraving from the eighteenth century depicting the explosion of one of Giambelli’s “hellburners” at the bridge of boats of the Duke of Parma in the Siege of Antwerp (1585) . 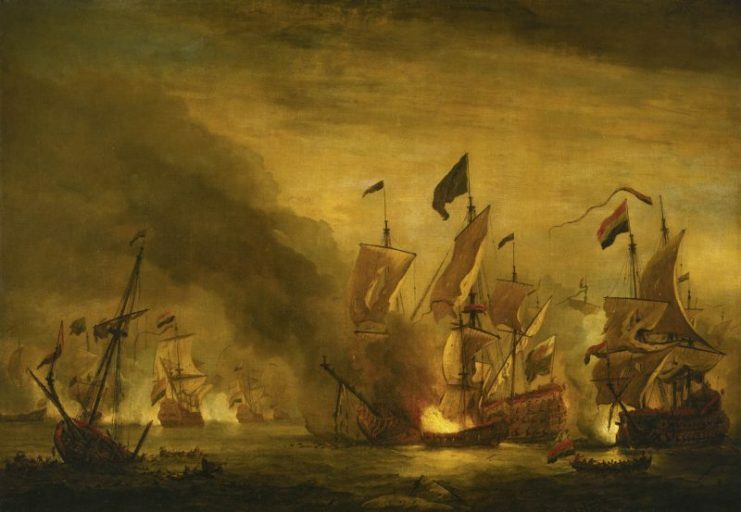 In order to prevent the hellburners from being destroyed and sunk from afar by Spanish cannons, Giambelli and the Dutch prepared thirty-two standard fireships which contained no explosives as decoys. Along with these thirty-two ships, Hope and Fortune were sent adrift down the River Scheldt on the night of April 4, 1585. The current and ebb tide carried the burning ships toward the Spanish blockade, with Fortune and Hope at the very back of the pack. The Spanish set about extinguishing the fires as the standard fireships approached. It was reported that many of them laughed mockingly at the sight. The thought of sending such a primitive assault against the might of the Spanish Armada seemed ridiculous. Little did they know what the final two fireships carried deep within their bowels, though. 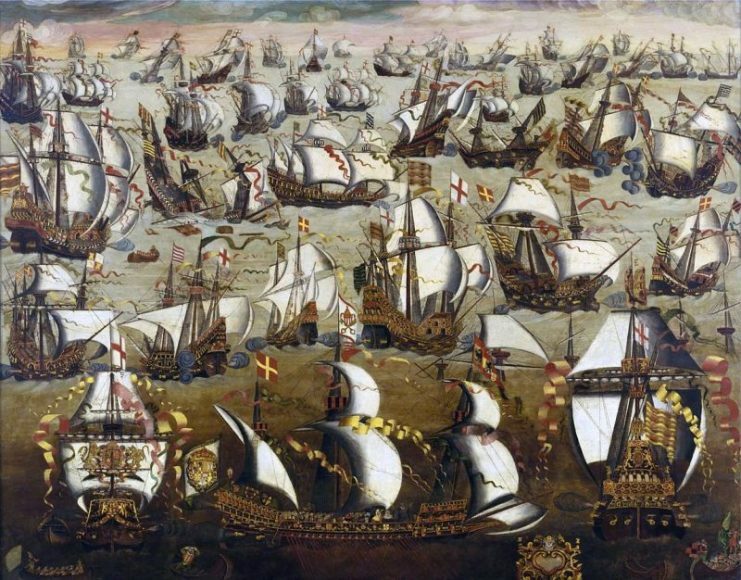 Spanish Armada and English ships, August 1588. Fortune ran aground before reaching the Spanish ships, but Hope remained on course. The Spanish allowed Hope to get close enough for them to extinguish the flames – and the clockmaker’s fuse turned out to be perfectly timed. Hope was almost touching the Spanish ships when the 7,000 pounds of gunpowder were detonated, and the Spanish must have thought that God Himself had hurled down a thunderbolt on them. The explosion was said to have been heard from fifty miles away, and houses and buildings in the nearby vicinity were flattened. Upwards of a thousand Spanish troops were killed instantly, and a quarter of their blockade was smashed to smithereens. 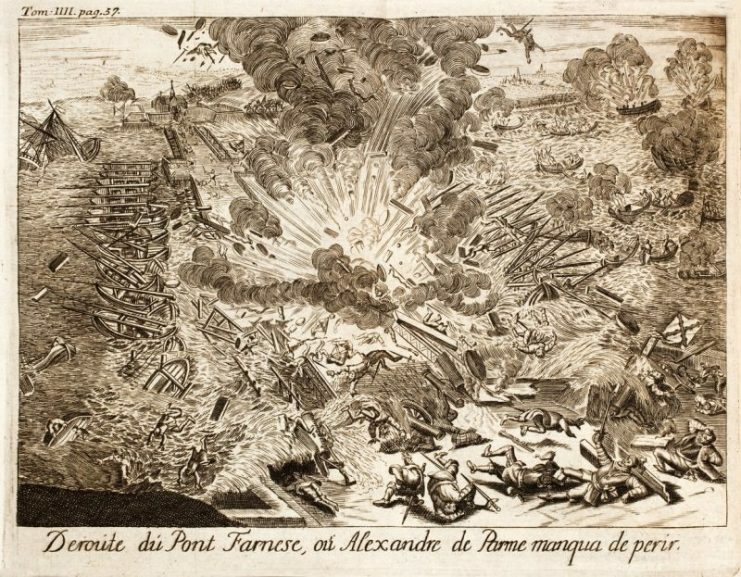 The waters of the Scheldt surged and flooded dykes, and debris rained down for miles. It was very likely that this was the largest man-made explosion in history up to this point. Unfortunately for the Dutch, who had perhaps not been expecting quite such a gargantuan explosion, they were too stunned to fully capitalize on the success of the hellburner’s blast. Despite the initial shock of the explosion, the Spanish recovered relatively quickly, and ultimately managed to rebuild their blockade and take Antwerp within a year. Giambelli, however, escaped to England, and there he offered his services to Queen Elizabeth. She had heard of his hellburners, and was only too happy to hire him. It turned out, however, that she wanted him more for his reputation than his skills. The Spanish now feared Giambelli’s hellburners, and Elizabeth made it known that he was working for her. During the Battle of the Gravelines in 1588, the English sent five fireships at the Spanish fleet while they were sheltering at Calais. 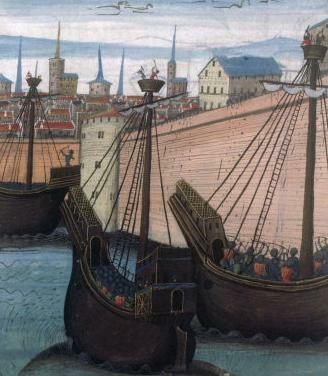 Believing that they were hellburners, the Spanish ships broke formation and scattered – and the English thus managed to stave off the possibility of a Spanish invasion on Giambelli’s reputation alone. Hellburners were not used again, as it was simply too costly to use that much gunpowder for a single explosion. It would be many centuries before the destructive potency of their explosions was equaled.